Dimplex portable radiators are available in two types of technology, either traditional Oil-filled variants or patented Oil-free versions. They are both incredibly durable and, unlike fan heaters or convectors, offer a combination of both convected and radiant heat, making them suitable to heat whole rooms or provide a personal form of heating. But what exactly is the difference between them? Due to the fact you don’t have to wait for the fluid inside to get to temperature, Oil-free radiators offer a more rapid heat up when compared to their traditional Oil-filled counterparts. Once at temperature however, both radiators use a combination of convected and radiant heat, both pushing the heat out of the heater and warming the air that naturally circulates throughout the room. All Dimplex portable radiators come in a choice of three principle ranges that offer different designs and control options to meet all needs. Selected models feature electronic climate control and can be controlled remotely via Bluetooth from your smartphone. Oil-free radiators contain, as the name suggests, no oil. This means that there is no pressurised container - removing the risk of any ruptures and leaks. They are also, on average, 10% lighter than their equivalent Oil-filled radiators, making for greater portability and ease of use. An Oil-free radiator can not only offer up to 9% energy savings* compared to an Oil-filled variant, it also has a smaller carbon footprint and has no special recycling requirements. Both Oil-filled and Oil-free portable radiators are maintenance free and efficient to run, making them perfect supplementary heating in your home. 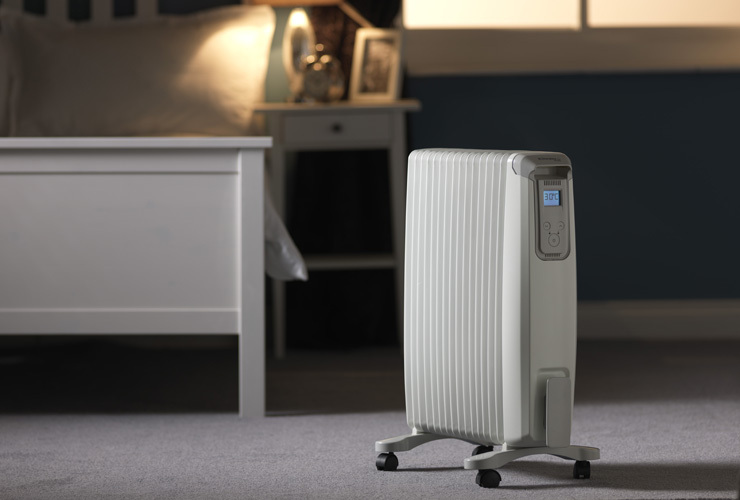 However, when you are choosing between more traditional and modern technology, it is clear that Oil-free portable radiators can provide greater performance and ease of use. * Based on a 2kW OFRC heating a room from 10oC to 22oC, maintaining 22oC for 5 hours and then switched off versus 2kW oil column radiator.